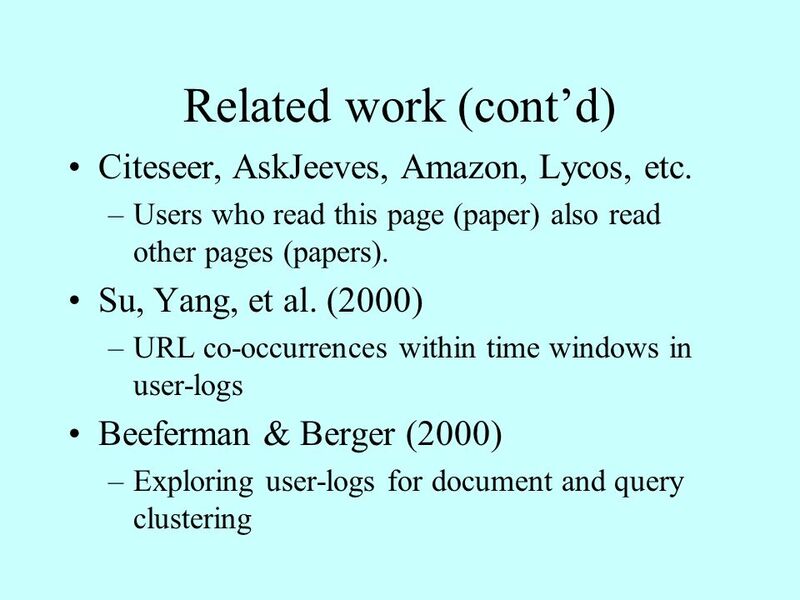 Mining User-logs for Query and Term Clustering - An exploration on Encarta encyclopedia Jian-Yun Nie, RALI, DIRO, Univ. 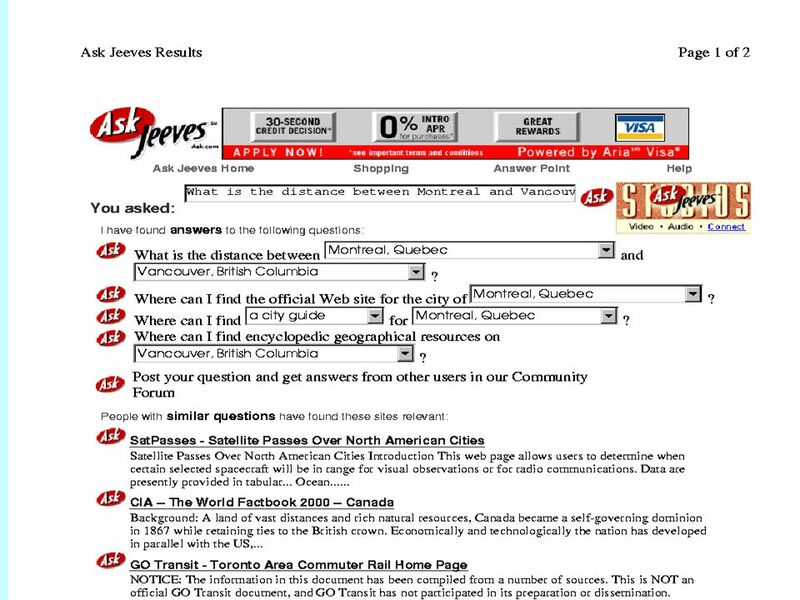 Montreal Ji-Rong Wen, Hong-Jiang. 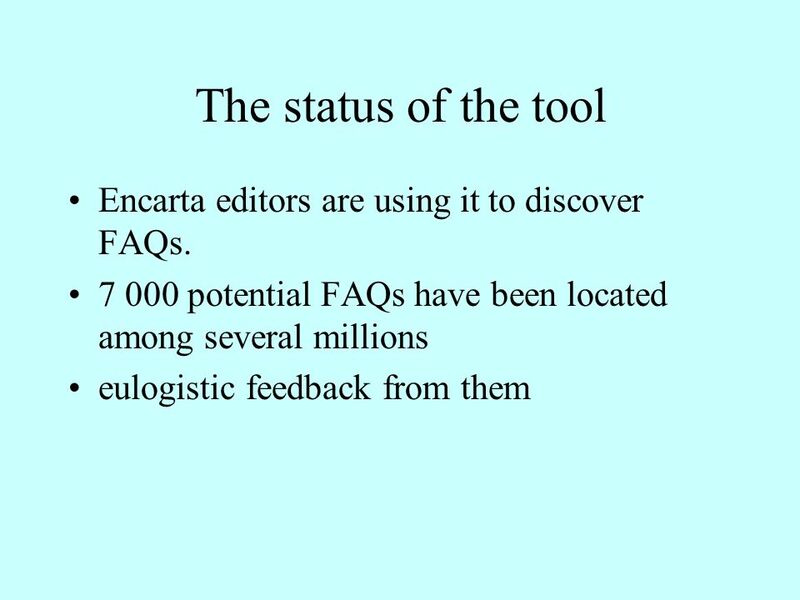 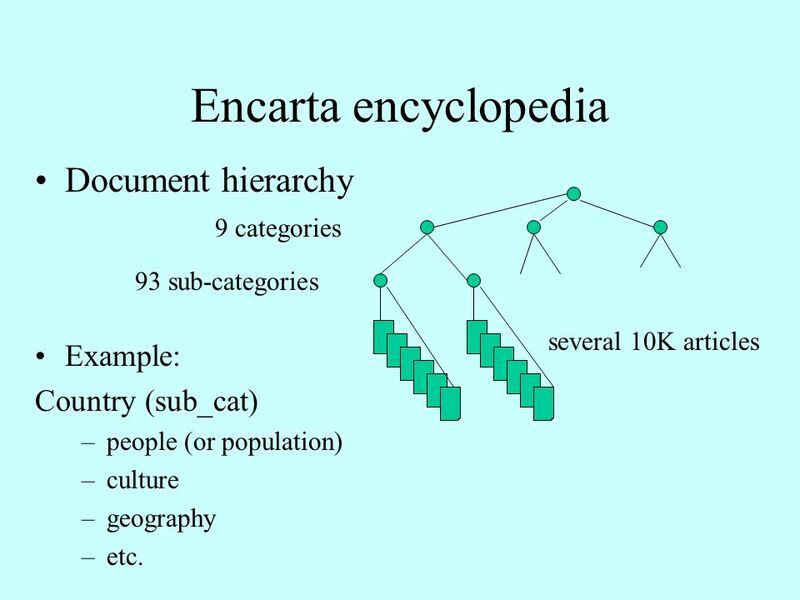 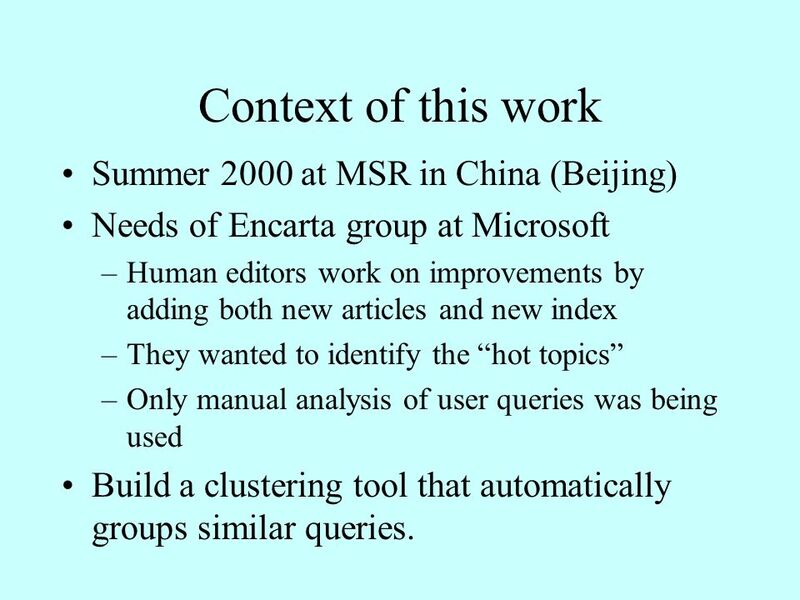 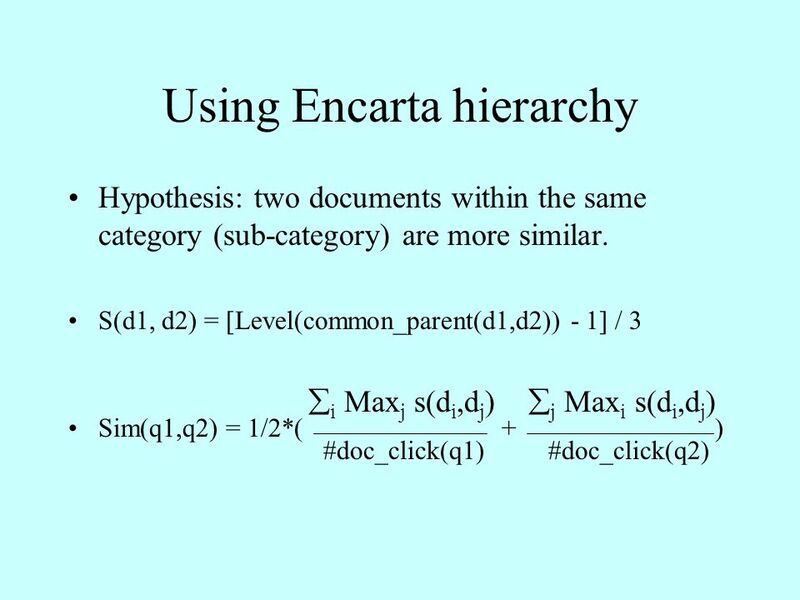 2 Context of this work Summer 2000 at MSR in China (Beijing) Needs of Encarta group at Microsoft –Human editors work on improvements by adding both new articles and new index –They wanted to identify the “hot topics” –Only manual analysis of user queries was being used Build a clustering tool that automatically groups similar queries. 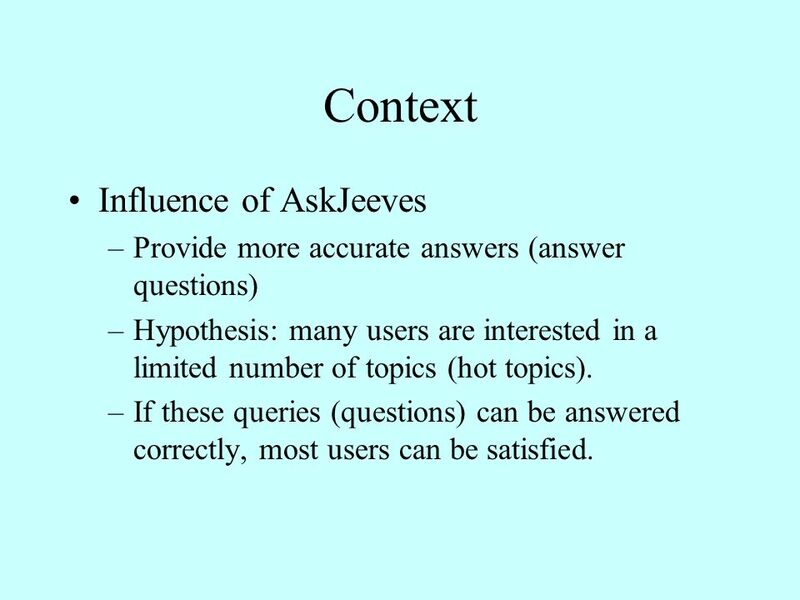 3 Context Influence of AskJeeves –Provide more accurate answers (answer questions) –Hypothesis: many users are interested in a limited number of topics (hot topics). 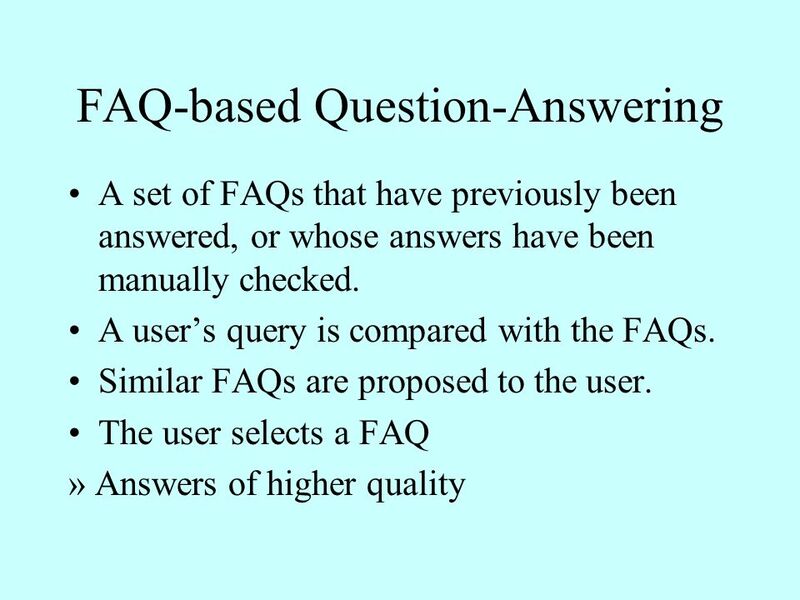 –If these queries (questions) can be answered correctly, most users can be satisfied. 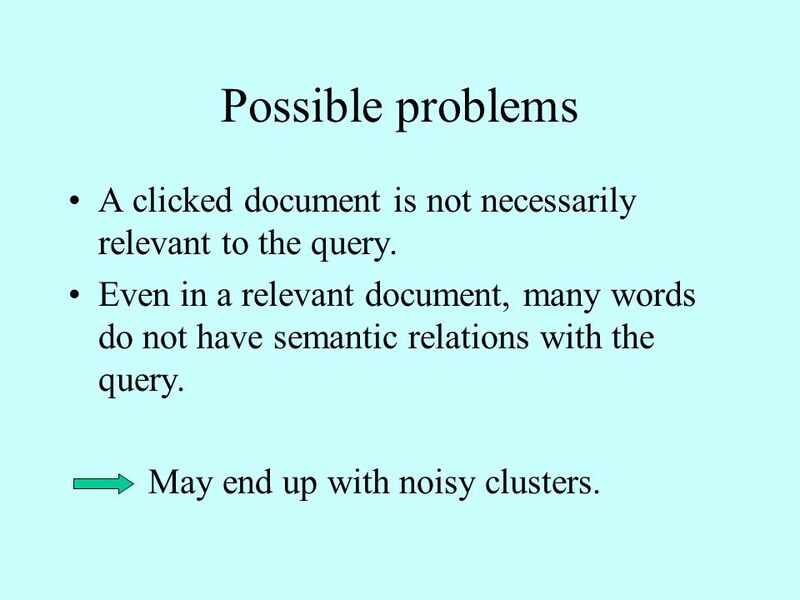 15 Possible problems A clicked document is not necessarily relevant to the query. 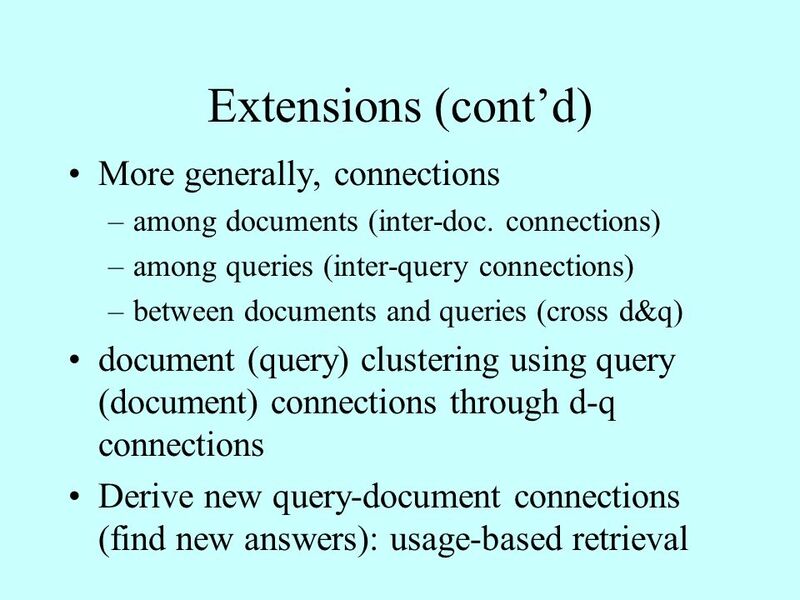 Even in a relevant document, many words do not have semantic relations with the query. 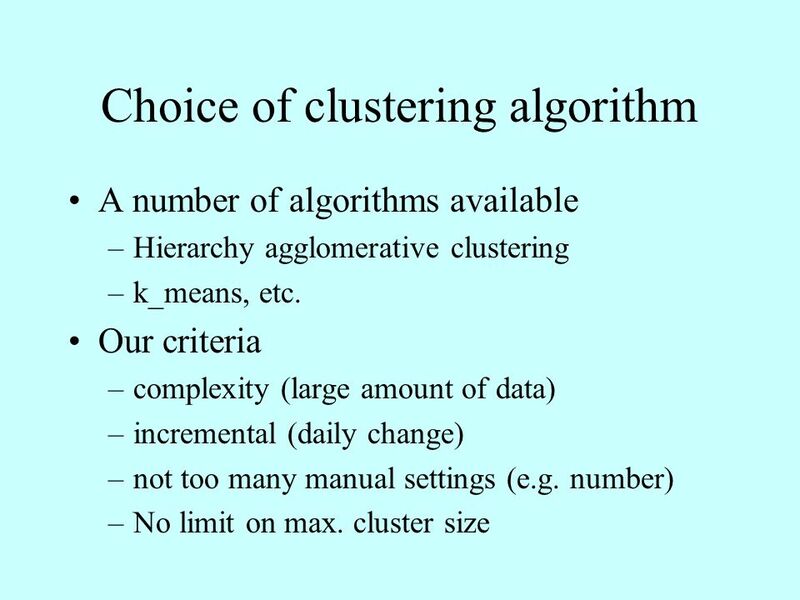 May end up with noisy clusters. 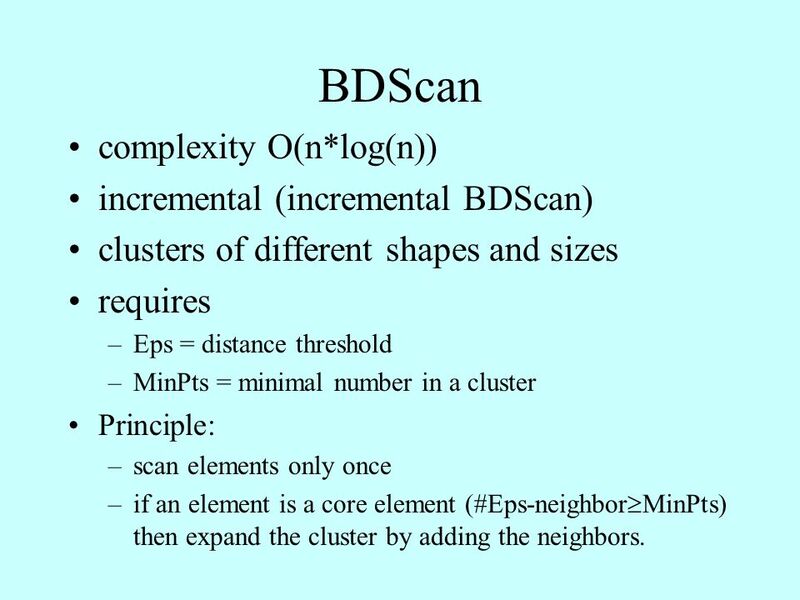 21 BDScan complexity O(n*log(n)) incremental (incremental BDScan) clusters of different shapes and sizes requires –Eps = distance threshold –MinPts = minimal number in a cluster Principle: –scan elements only once –if an element is a core element (#Eps-neighbor  MinPts) then expand the cluster by adding the neighbors. 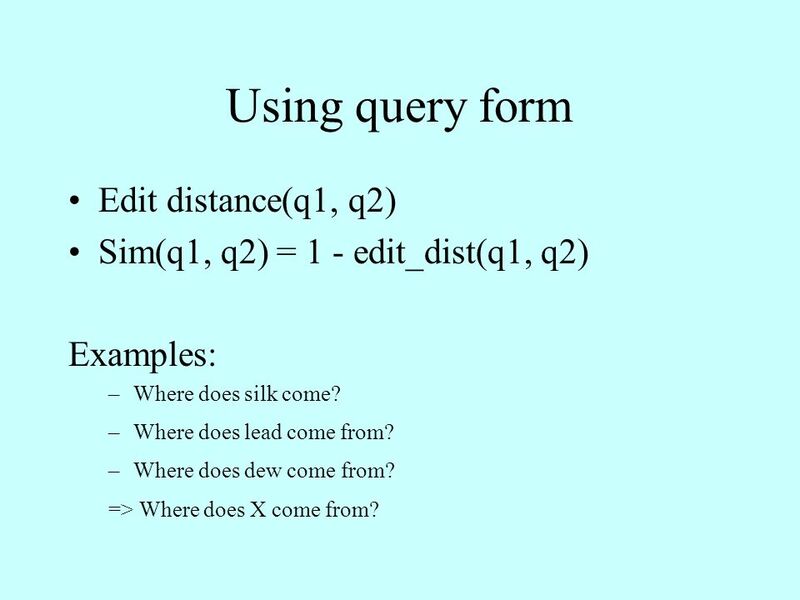 23 Using query form Edit distance(q1, q2) Sim(q1, q2) = 1 - edit_dist(q1, q2) Examples: –Where does silk come? 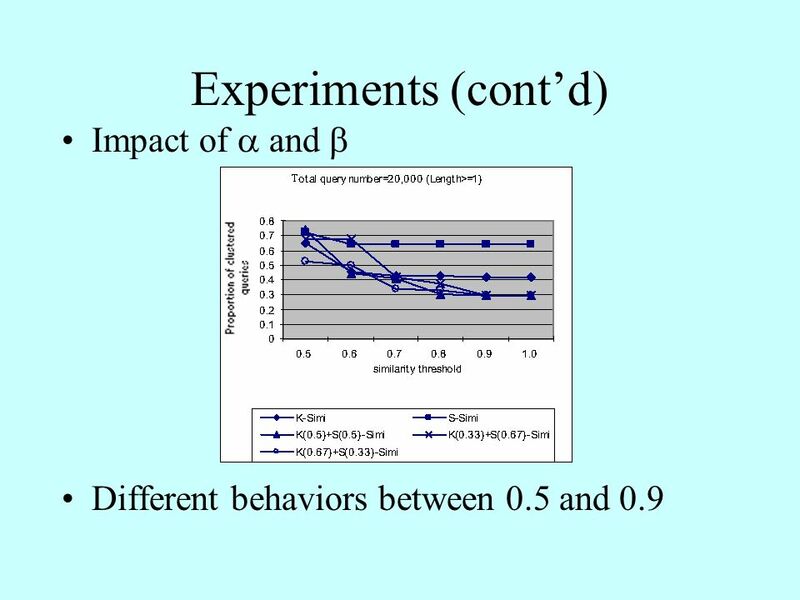 –Where does lead come from? 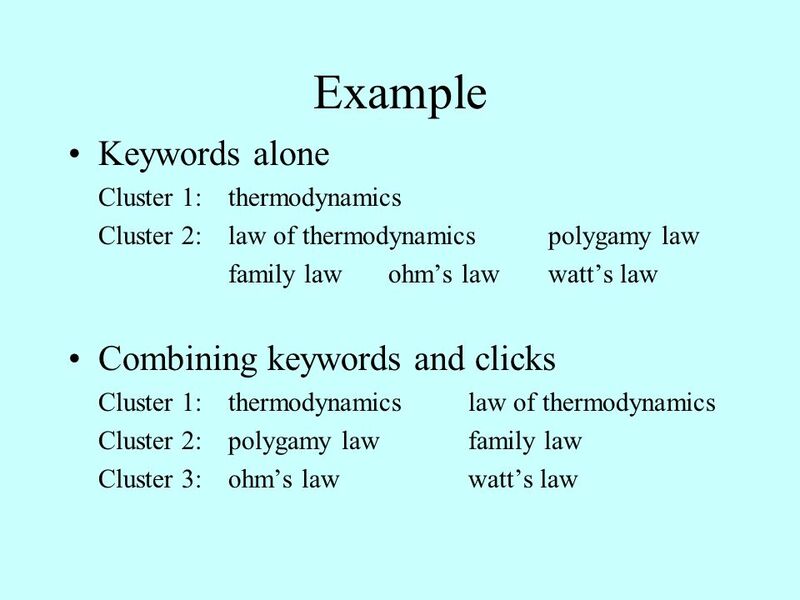 –Where does dew come from? 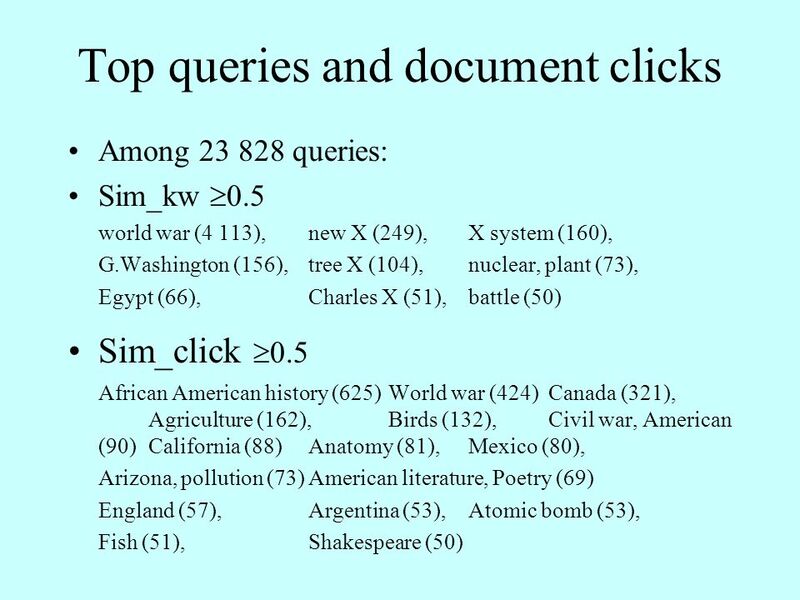 => Where does X come from? 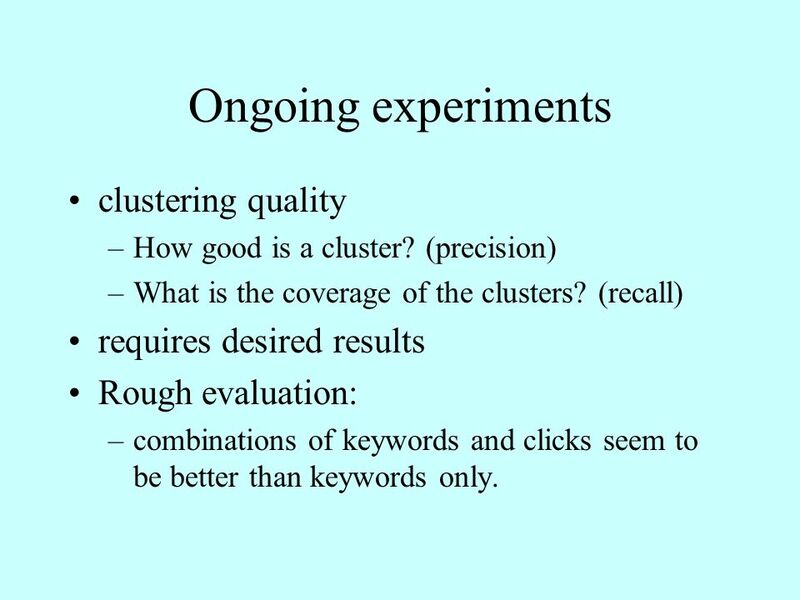 31 Ongoing experiments clustering quality –How good is a cluster? 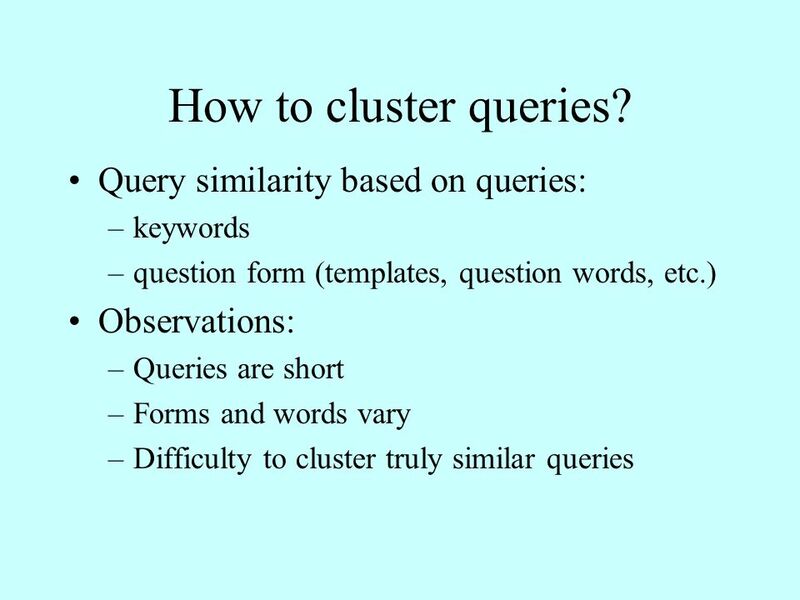 (precision) –What is the coverage of the clusters? 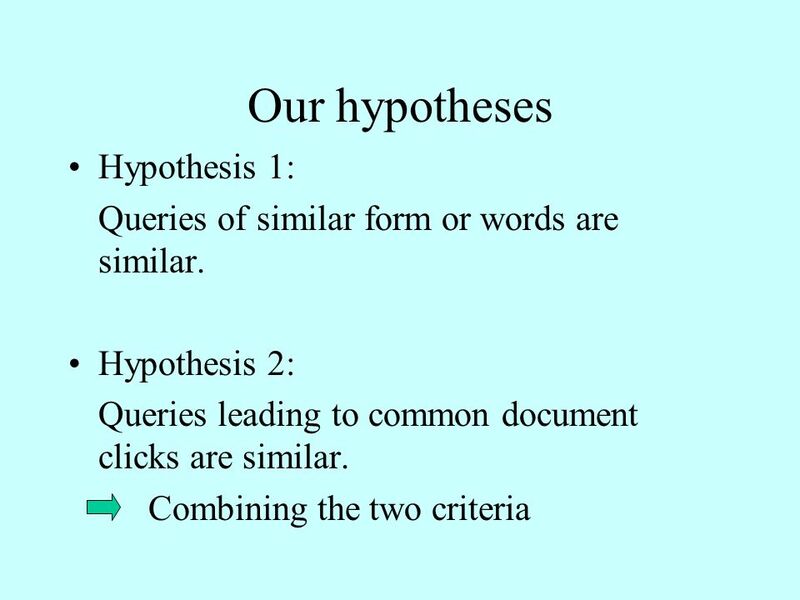 (recall) requires desired results Rough evaluation: –combinations of keywords and clicks seem to be better than keywords only. 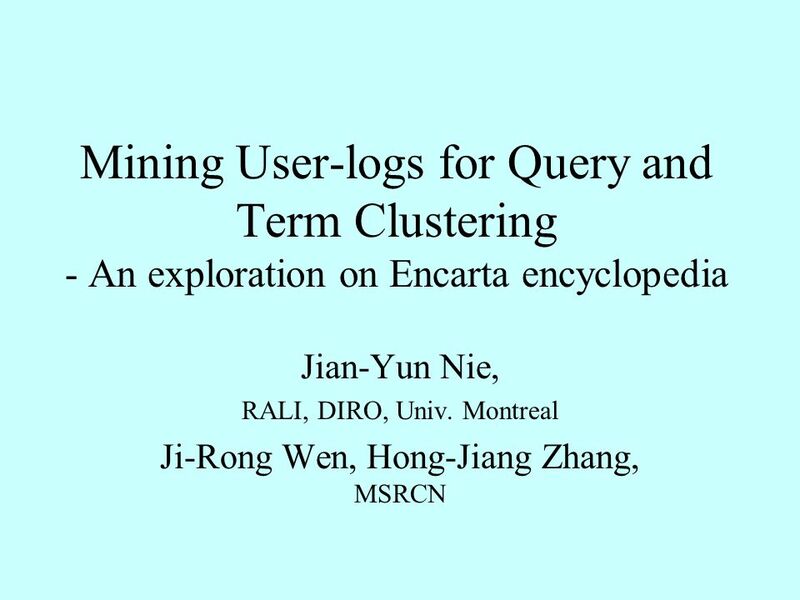 Download ppt "Mining User-logs for Query and Term Clustering - An exploration on Encarta encyclopedia Jian-Yun Nie, RALI, DIRO, Univ. 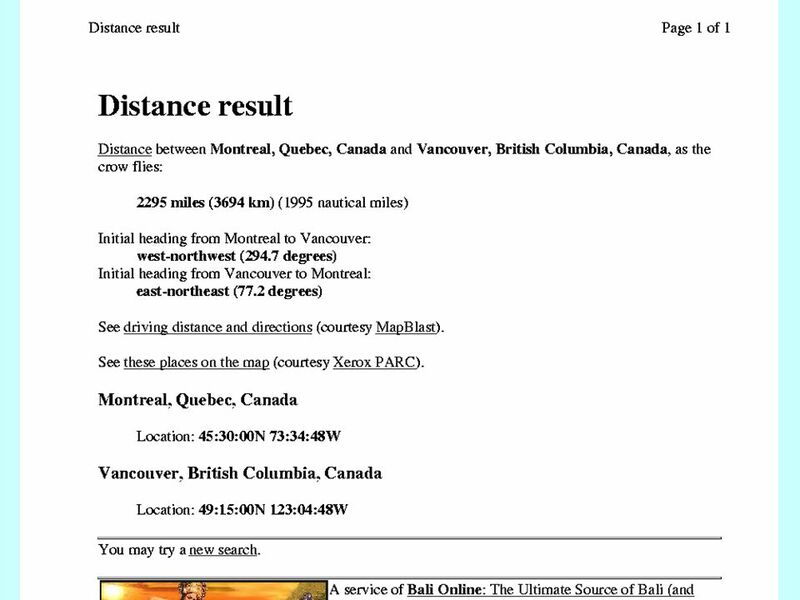 Montreal Ji-Rong Wen, Hong-Jiang." 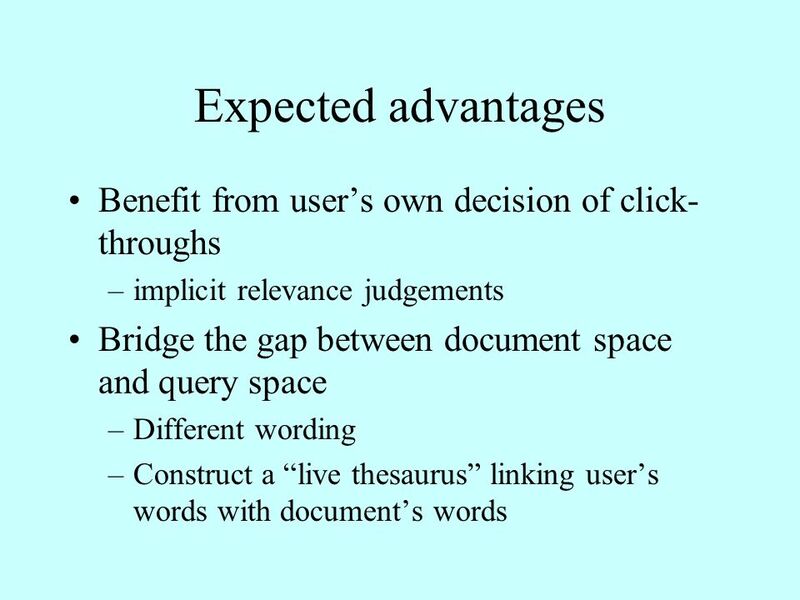 Data Mining and the Web Susan Dumais Microsoft Research KDD97 Panel - Aug 17, 1997. 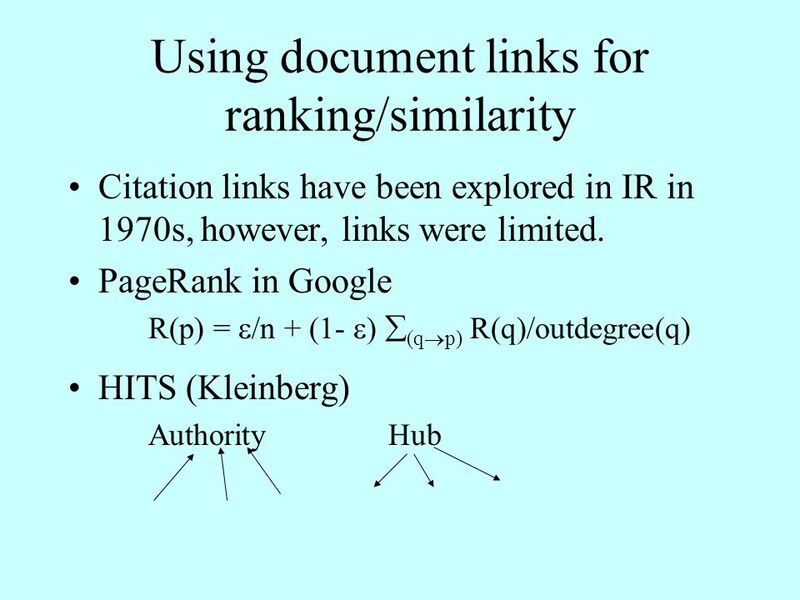 A Comparison of Implicit and Explicit Links for Web Page Classification Dou Shen 1 Jian-Tao Sun 2 Qiang Yang 1 Zheng Chen 2 1 Department of Computer Science. 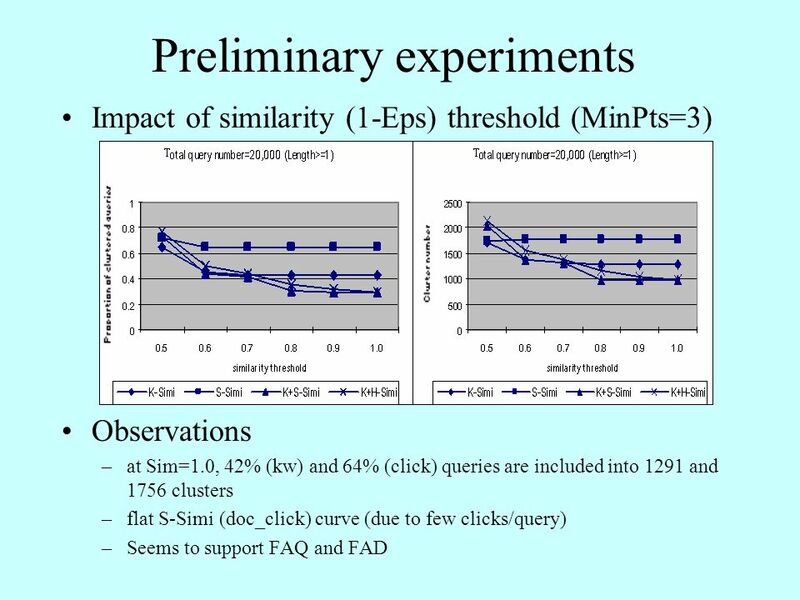 Date: 2013/1/17 Author: Yang Liu, Ruihua Song, Yu Chen, Jian-Yun Nie and Ji-Rong Wen Source: SIGIR12 Advisor: Jia-ling Koh Speaker: Chen-Yu Huang Adaptive. 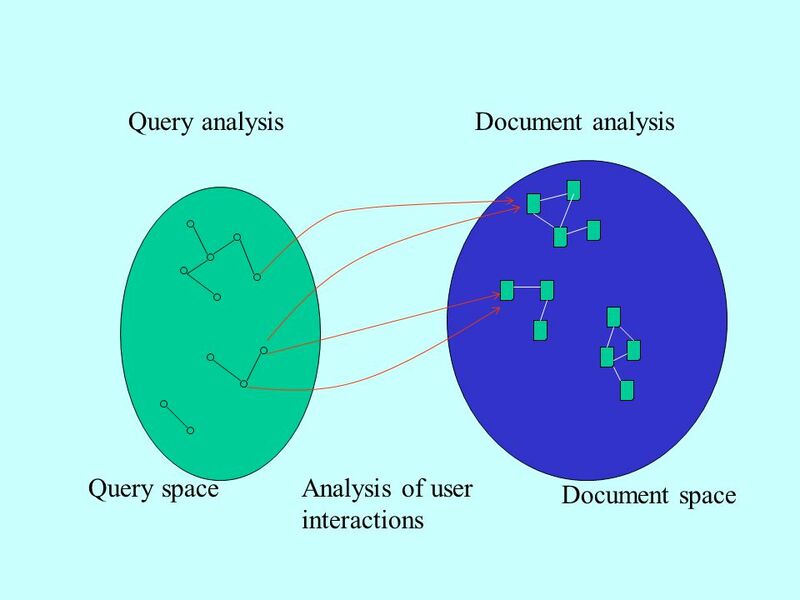 Query Operations: Automatic Local Analysis. 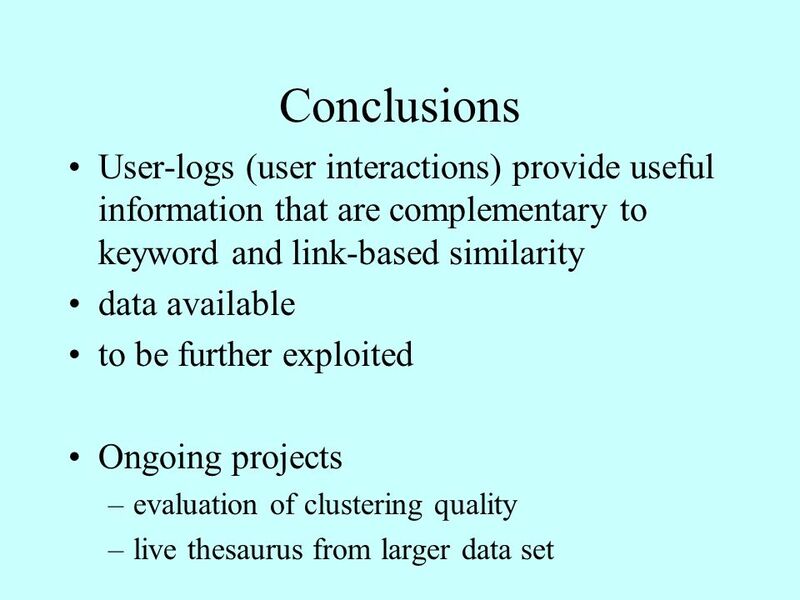 Introduction Difficulty of formulating user queries –Insufficient knowledge of the collection –Insufficient. 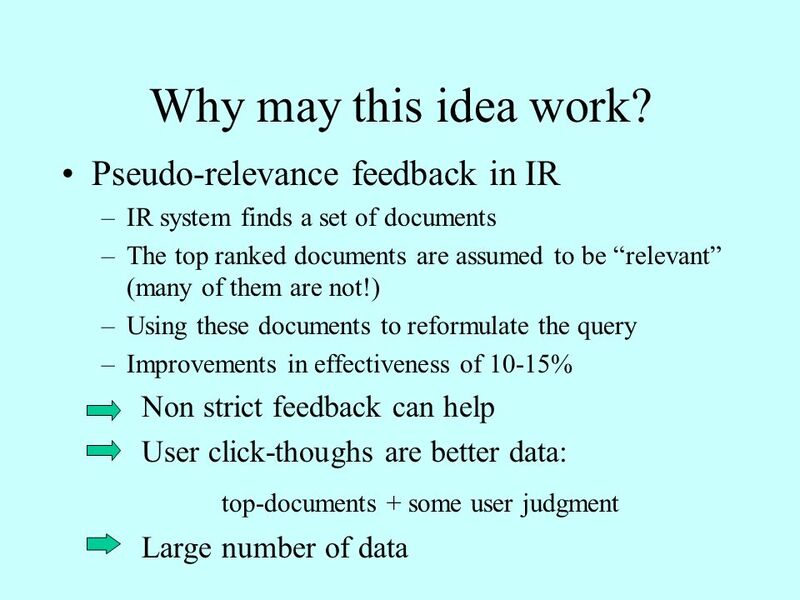 1 CS 430 / INFO 430 Information Retrieval Lecture 8 Query Refinement: Relevance Feedback Information Filtering. 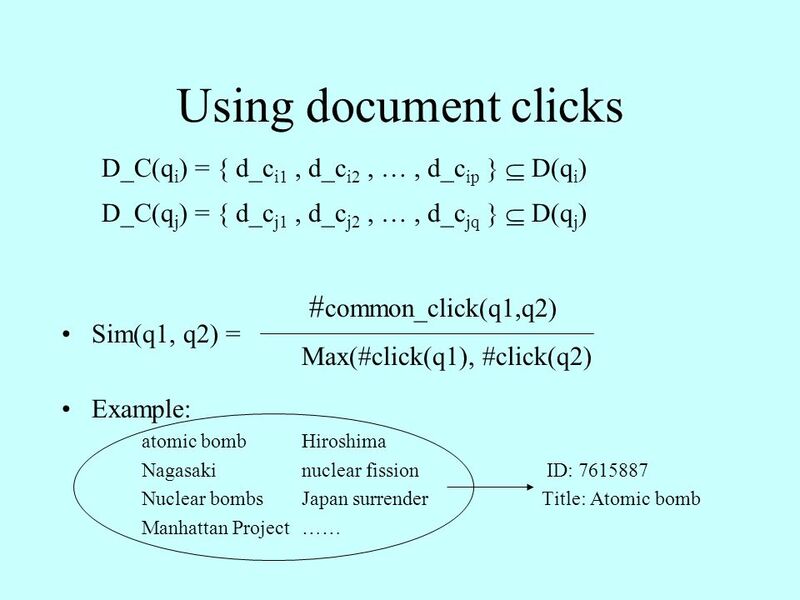 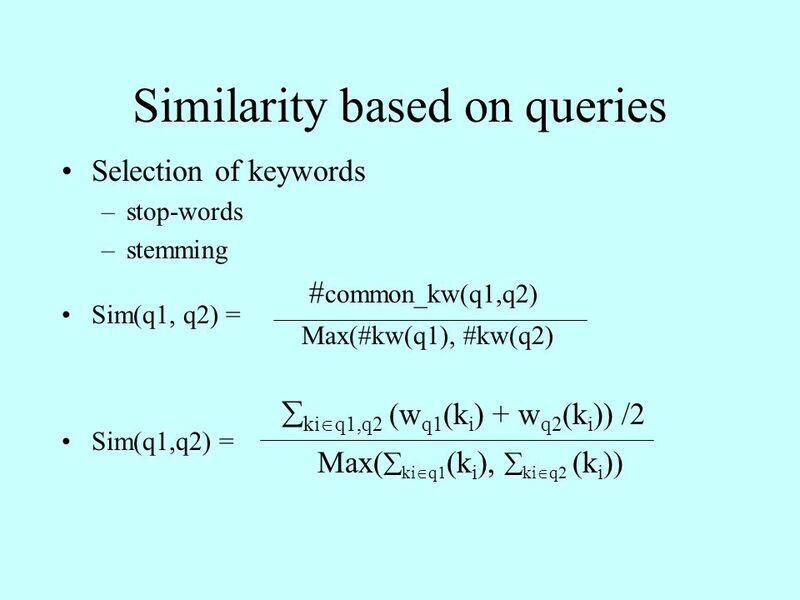 Time-dependent Similarity Measure of Queries Using Historical Click- through Data Qiankun Zhao*, Steven C. H. Hoi*, Tie-Yan Liu, et al. 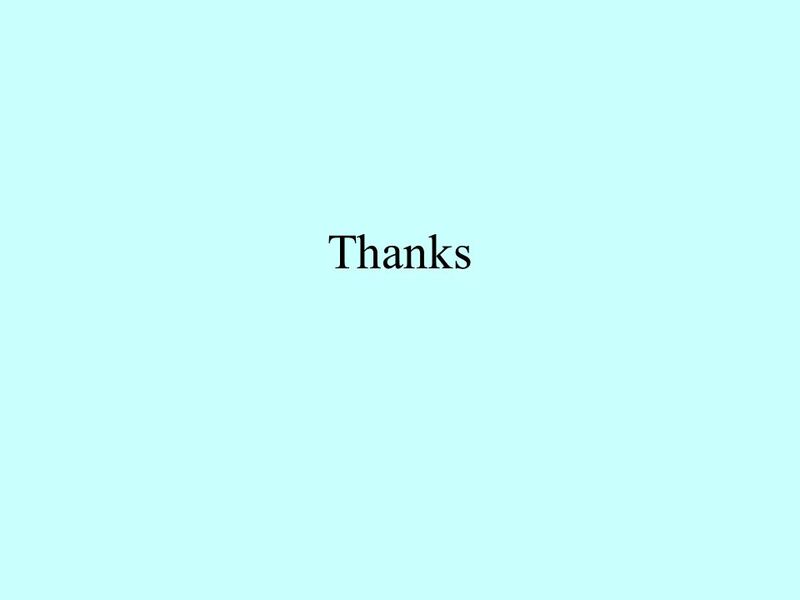 Presented by: Tie-Yan. 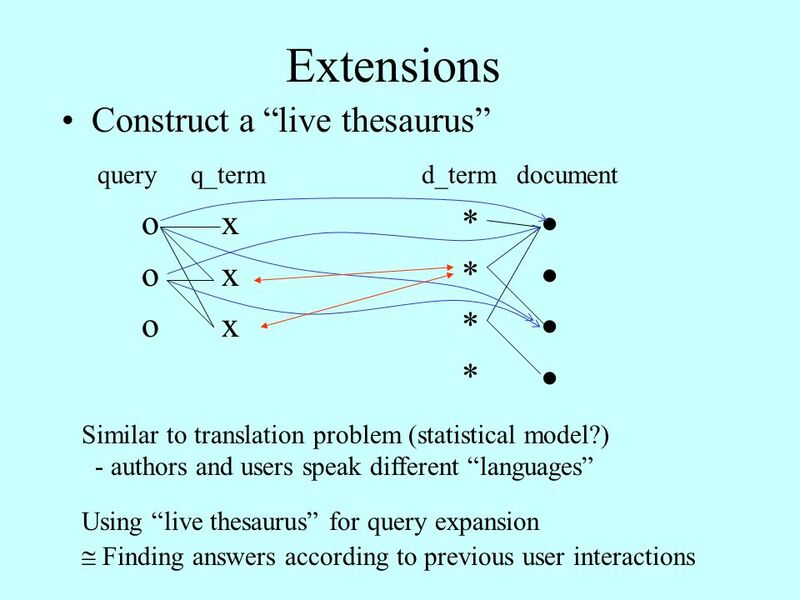 Context-Aware Query Classification Huanhuan Cao 1, Derek Hao Hu 2, Dou Shen 3, Daxin Jiang 4, Jian-Tao Sun 4, Enhong Chen 1 and Qiang Yang 2 1 University. 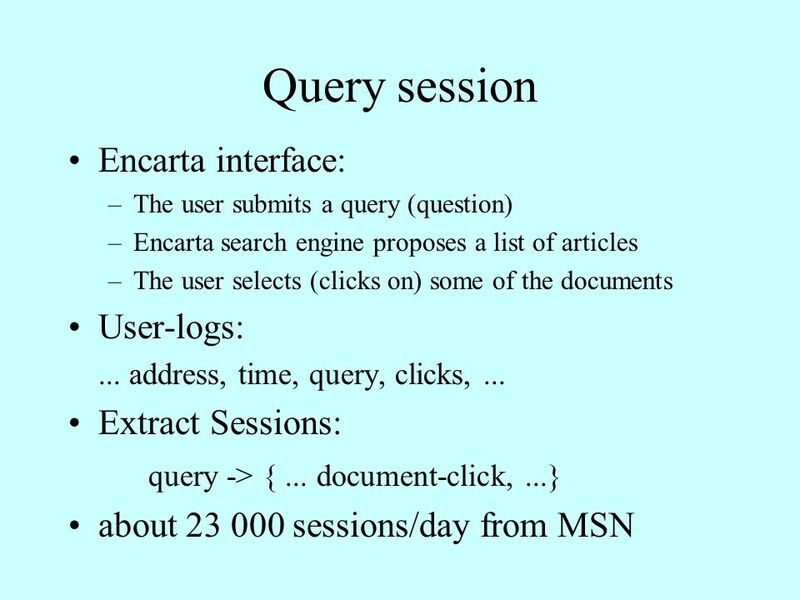 Chapter 5: Query Operations Baeza-Yates, 1999 Modern Information Retrieval. 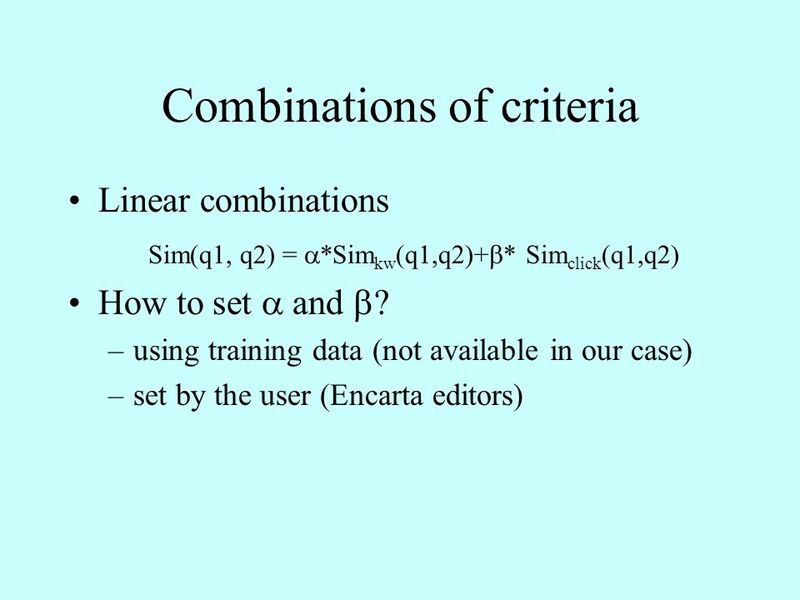 Affinity Rank Yi Liu, Benyu Zhang, Zheng Chen MSRA. 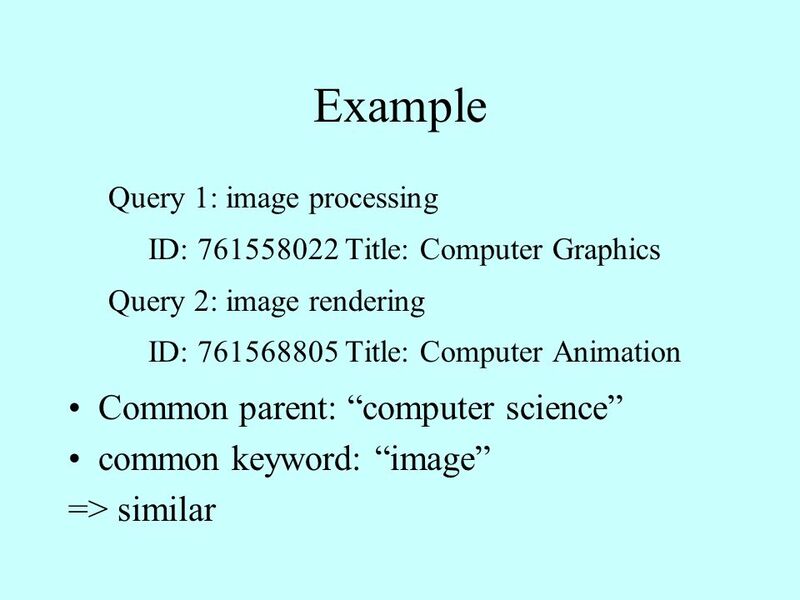 Query Operations: Automatic Global Analysis. 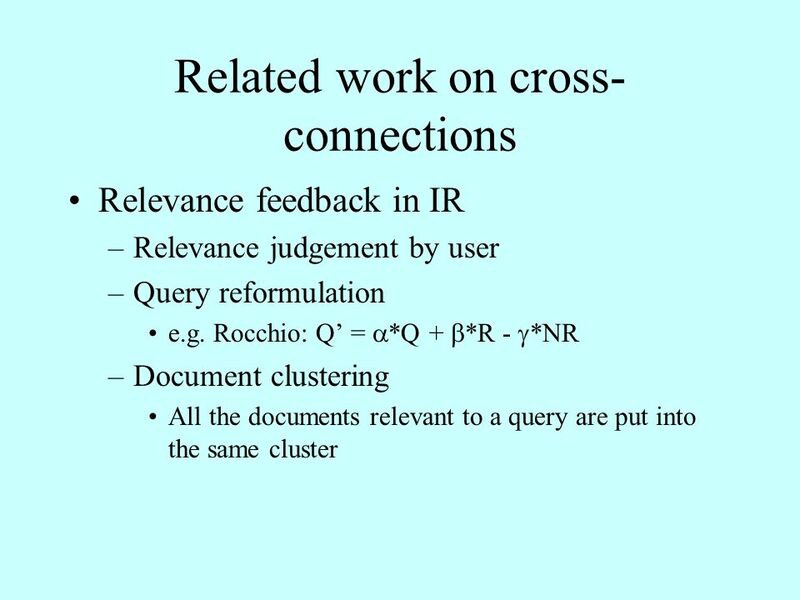 Motivation Methods of local analysis extract information from local set of documents retrieved to expand. 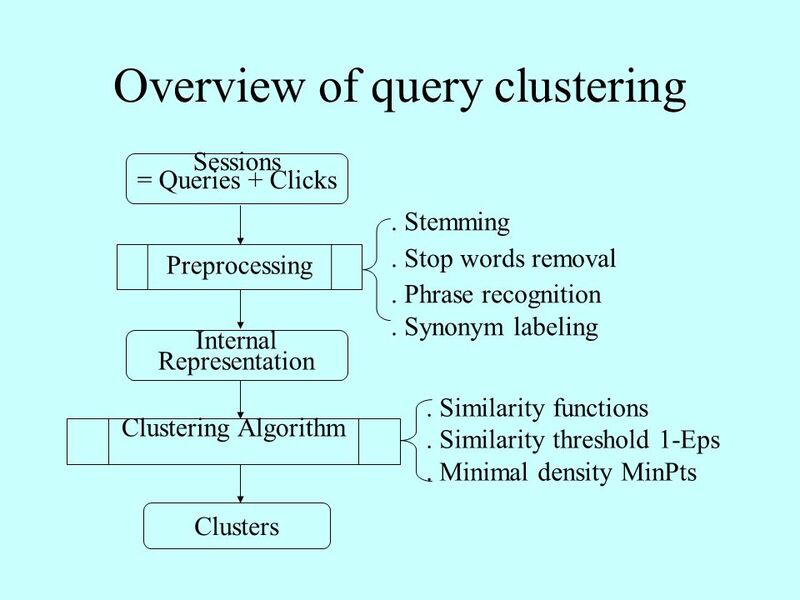 Basic Machine Learning: Clustering CS 315 – Web Search and Data Mining 1.